WHMCS 7.7 introduces a new way to browse modules and integrations available for WHMCS. 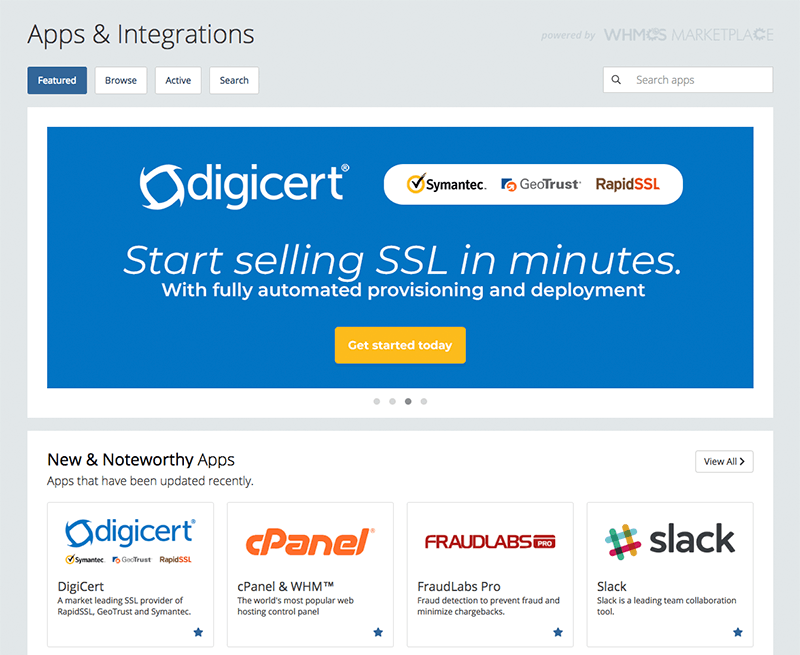 Includes all apps and integrations shipped with WHMCS by default as well as selected apps and integrations from the WHMCS Marketplace. Accessible via the Setup menu, give it a try today. 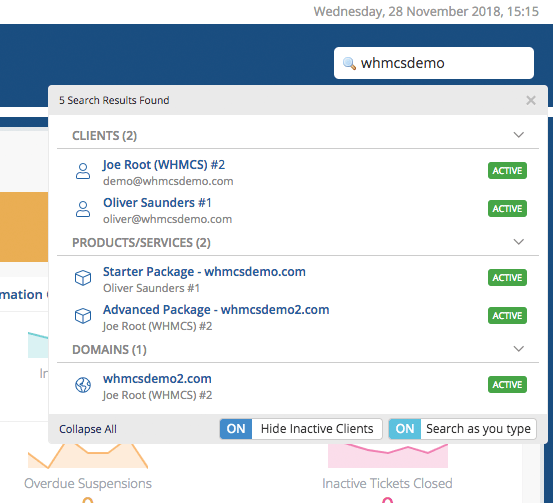 WHMCS 7.7 has a new look for intelligent search but that's not all. We've implemented a number of feature requests including search as you type functionality, the ability to expand results where more than 10 matches are found and hiding of inactive clients that restricts search results to only active customers by default, with a toggle option to reveal hidden users. In addition to minimising and hiding widgets, you can now drag and drop widgets to re-arrange and prioritise the widgets that matter most to you. Widget display preferences are saved with your admin profile so that settings persist between admin sessions and across devices. 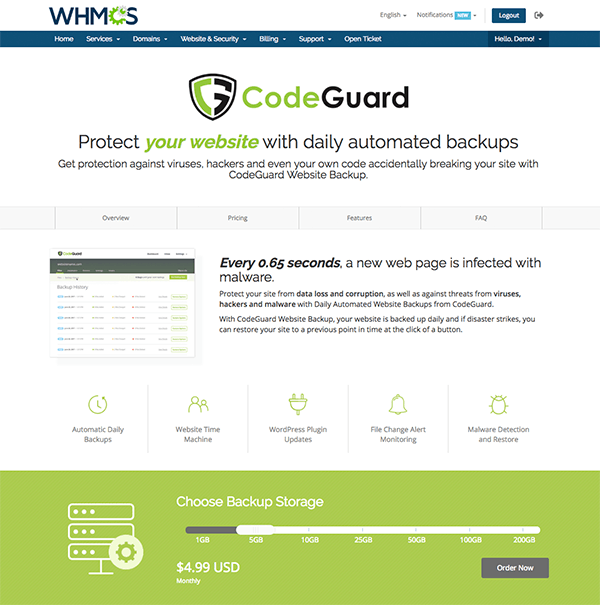 New integration with CodeGuard allows you to offer independent daily automated website backups from just $2.99/mo. Store file uploads and attachments in Amazon's industry-leading object storage service, or any S3 compatible service provider, for improved reliability and scalability of your WHMCS file attachments. Using a dedicated remote file object storage service such as Amazon S3 gives you an infinitely scalable object store, the ability to separate user files and data from your core website and server backups, and makes it easier to share files across multiple instances of the WHMCS product in a highly available setup. We've created a powerful control and migration system that allows you to customise the storage destination for each file type WHMCS supports along with a built-in and fully automated migration process that makes it easy to switch between local and remote file storage options. On supported pages lists and search results will now hide inactive clients by default to make managing, browsing and searching for clients easier and faster by restricting results to the most relevant results first. Client dropdowns have also been updated to group active clients top most, with inactive clients grouped at the bottom. A new toggle button allows you to easily toggle to view inactive or closed clients when needed. Invisible reCAPTCHA is designed to be transparent to most users while still protecting against bots and automated submissions. Only when Google detects suspicious behaviour or traffic will a captcha challenge be presented. In WHMCS 7.7 we've made Invisible reCAPTCHA available in additional locations including the domain checker, ticket submission page, contact form and login pages along with giving you finer grained control over where captcha is required. The Tax Configuration UX has been overhauled to provide a simplified and improved experience. Everyone who works with taxes has to keep track of customer Tax ID's and VAT Numbers, and in WHMCS 7.7 we've made it easier by adding native fields for storing these to both clients and contacts. There's also a migration routine for migrating existing Tax ID's and VAT Numbers from custom fields to the new native fields. In addition, there's now support for providing your own VAT or Tax ID which is always displayed on invoices, the ability to auto configure EU VAT rules and automatically sync/update existing ones, as well as new functionality which captures and stores a customers country at the time of invoice generation to provide greater consistency and accuracy when reporting of revenue figures by country in reports. Introducing support for FraudLabs Pro, an alternative to MaxMind that provides fraud risk metrics, analysis and insights to provide automatic and proactive fraud screening of new orders. Plus get access to over 50 location, network and other geographic and statistical data points to help you make more informed decisions about which orders are genuine and to accept and approve. New integration with GoCardless allows you to accept Direct Debit payments across the UK, Europe, Canada, Australia and New Zealand. Integration with BitPay also allows you to start accepting BitCoin and BitCoin Cash and receive funds directly to your bank account with support for over 35 countries. Know if domains have SSL Certificates, see their expiry dates and easily add SSL to domains currently running without it. Store sessions in the database to enable use of WHMCS in multi-instance setups for load balancing and high availability.